Civil War Reenactors at Fort Point. 2009 photo by Penny Meyer. 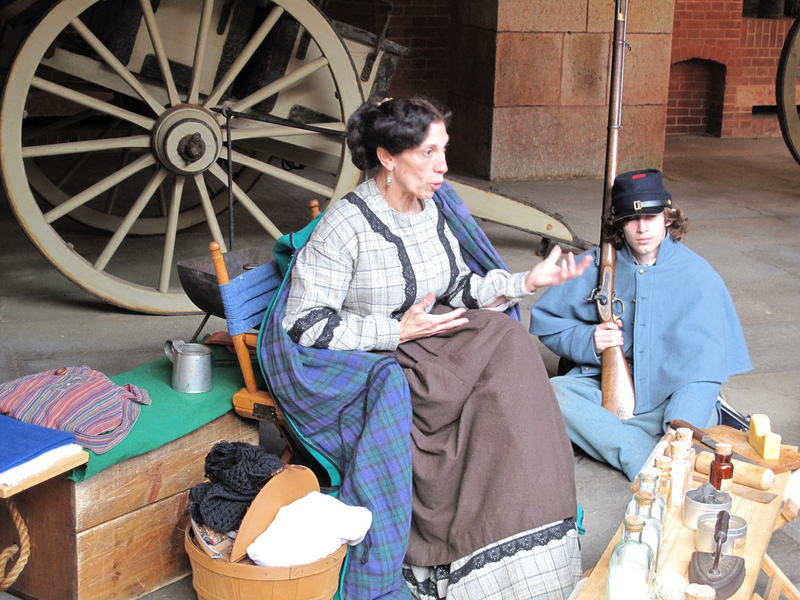 On August 13, 2011 from 10:00 a.m. to 5:00 p.m., Civil War Living History Day will take place at Fort Point in San Francisco’s Presidio, in the Golden Gate National Recreation Area. San Francisco supported the Union during the American Civil War in the form of volunteer military recruits and the provision of many millions of dollars in gold. In turn, the city was impacted by measures to protect San Francisco Bay from possible Confederate or foreign aggression – including the installation of new batteries on Fort Point, Alcatraz, and Angel Island. Following the Union victory and possibly as early as the 1890s panoramic exhibitions of the American Civil War were staged in San Francisco. “Living history” reenactments – in which performers portray historical persons for audiences outside of traditional theatrical settings – have provided further opportunities to interpret the Civil War-era San Francisco. 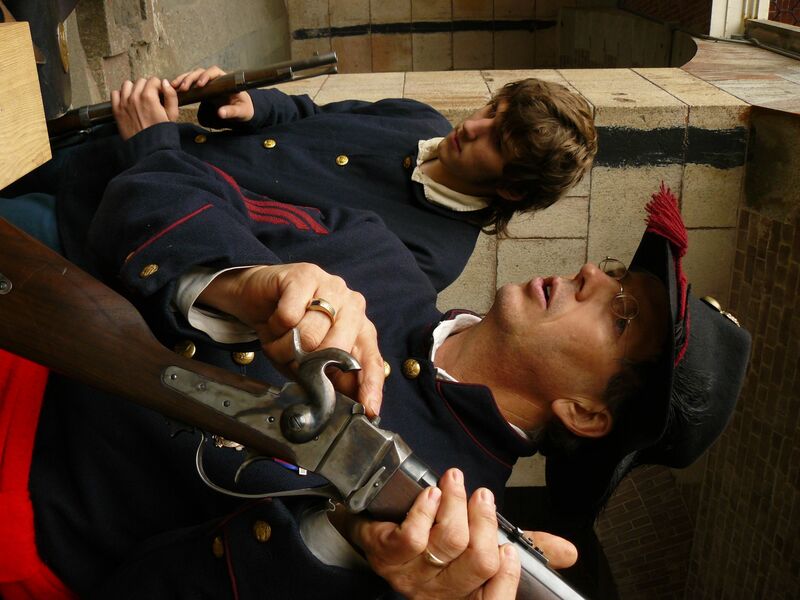 While living history programs can be found in many other parts of California (for example, Cultural Heritage Day at Fort Ross, Living History and Pioneer Demonstration Days at Sutter’s Fort, Living History Day at the Petaluma Adobe State Historic Park, and the Old Sacramento Living History Program), Civil War reenactment at the Fort Point is one of the few living history programs in San Francisco. The National Civil War Association first organized Civil War reenactments at Fort Point in the 1980s in cooperation with the National Park Service. The program was discontinued in the 1990s, but was revived around 1998 by Mike Musante of the 20th Maine Volunteer Infantry, Company G, a unit of the American Civil War Association. Musante originally created the event as the occasion for the 20th Maine’s annual meeting and elections. Since then, Musante and a team of associates have worked with the Park Rangers of the Golden Gate National Recreation Area to stage Civil War reenactments at Fort Point every January and most Augusts. Civil War Reenactor at Fort Point. 2009 photo by Penny Meyer. Civil War Reenactors at Fort Point. 2010 photo by Craig Glassner. Organizers of the event emphasize what they regard as appropriate attire for reenactors, instructing them not to wear “blue jeans or sunglasses” or “non- period jewelry and wristwatches.” This speaks to a distinction made by some living history performers among so-called “farbs” (those who allow for anachronisms in their costuming), “mainstream” performers (who strive for authenticity in outward appearance and stay in character in front of audiences) and “progressives” (who seek authenticity in their costuming beyond outward appearance and who stay in character throughout the duration of an event). National Park Service regulations prohibit reenactors from staying in character when interacting with members of the public, but otherwise Musante characterized most of the reenactors at Fort Point as mainstream, along with “a good handful that are progressive.” Because the costs associated with appropriate costuming might otherwise be prohibitive for potential new recruits, items of military and civilian clothing are available on loan. 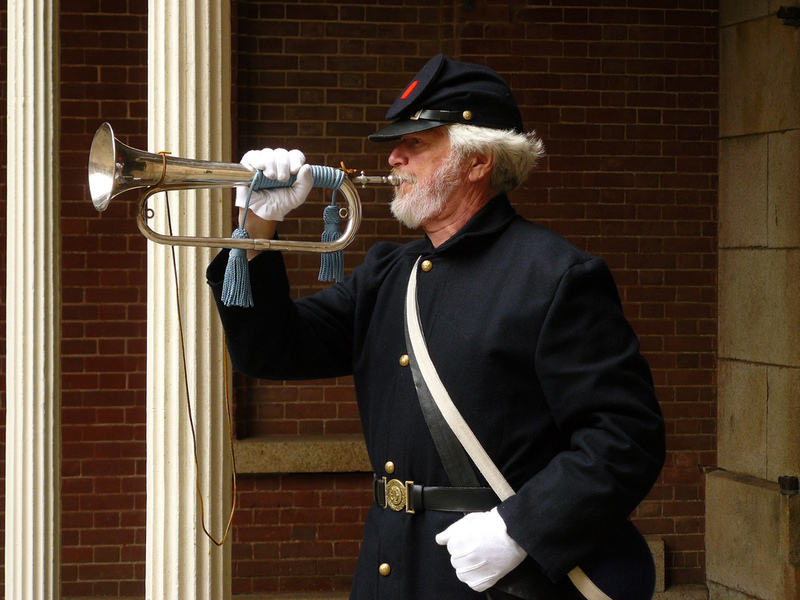 For an example of a unit of the American Civil War Association that will be participating in Civil War Living History Day on August 13, see the website of the 69th New York Volunteer Infantry, Company B. For additional information about the event, see the event webpage on the site of the 20th Maine Volunteer Infantry, Company G.
is there a date set for the reenactment at Ft. Point in Jan. 2012?